The movie is set for release on Christmas Day. 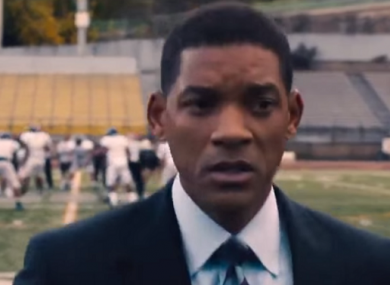 Will Smith stars in a new movie about CTE and concussion. WITH JUST OVER a week to go until the start of the new NFL season, Sony Pictures has unveiled the first trailer for their upcoming movie ‘Concussion’. The movie, starring Will Smith, is based on the life of Dr. Bennet Omalu, the forensic neuropathologist who first discovered Chronic Traumatic Encephalopathy (CTE) — a neuro-degenerative disease believed to be caused by by repeated head trauma. For this reason, Omalu has been a thorn in the side of the NFL who recently settled a multi-billion dollar law suit with former players suffering the long term consequences of concussions picked up in their playing days. Set for release on Christmas Day, the movie also stars Alec Balwin, Luke Wilson and Albert Brooks. Email “Watch the epic trailer for Will Smith's new movie about NFL concussions”. Feedback on “Watch the epic trailer for Will Smith's new movie about NFL concussions”.